Soft & chewy double chocolate chip cookies stuffed with ooey gooey caramel inside and drizzled with even more caramel on top for one amazingly delicious chocolate chip cookie! There’s just something about biting into a ooey gooey caramel inside cookie. If you love a chewy cookie, you’ll love this one. 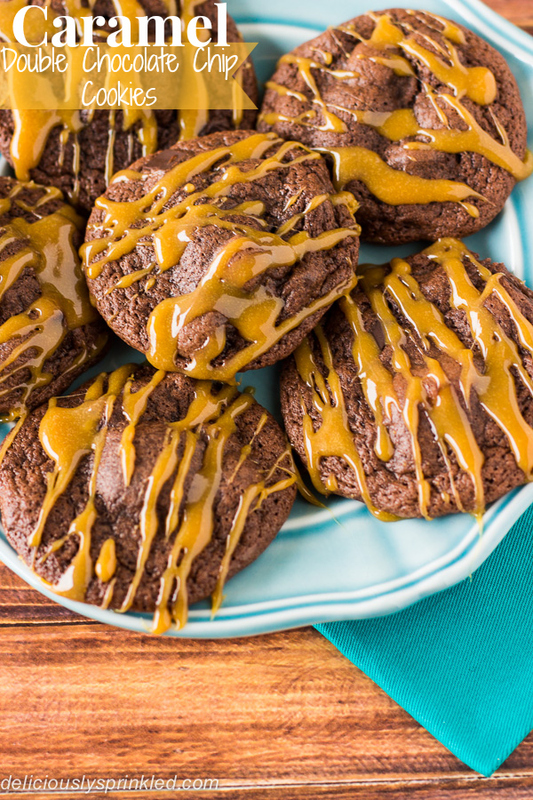 It’s a super chewy cookie with caramel hidden inside, then drizzled with even more caramel to make one of my favorite double chocolate chip cookies. These cookies are so easy to make and even easier to eat! I used Betty Crocker’s Double Chocolate Chunk cookie mix, and Kraft carmel squares. No need to use a mixer, just whisk together the cookie mix, one egg and vegetable oil. Scoop up about 2 tablespoons of dough, roll into a ball and then flatten and stick a caramel in each one, then roll back up into ball and place on the prepared baking sheets. I melted the leftover caramel squares to drizzle over the top of the cookies for even more caramel goodness. Yum! Pre-heat oven to 375F degrees. Line two large baking sheets with parchment paper or silicone baking mats. Set aside. Prepare dough by following the directions on the back of the Betty Crocker Double Chocolate Chunk Cookie Mix package. Using a cookie scooper, scoop one ball of dough and add a caramel square in the center. Then roll the dough into a ball covering the caramel completely. Place cookies on prepared cookie sheets, place balls 2 inches apart. Bake 10 to 11 minutes. Cool for 3 minutes. Add the leftover caramel squares and 2 tablespoons of water to a small saucepan over low-medium heat. Constantly stir, allowing the the caramels to fully melt. 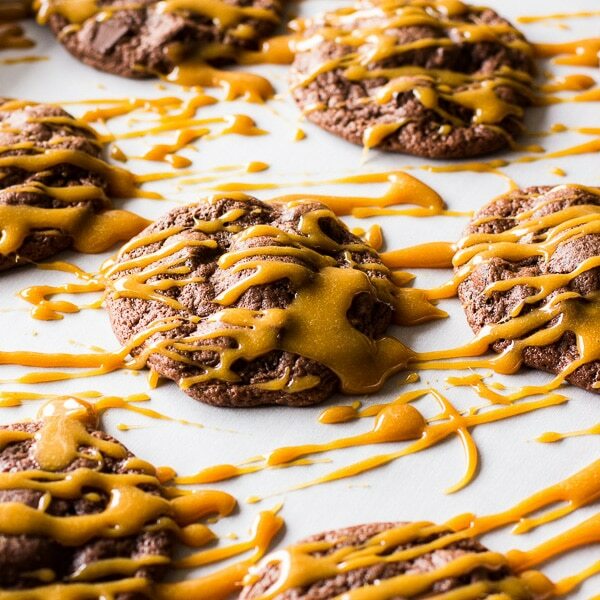 Drizzle warm caramel over cookies and allow to set for at least 5 minutes. I don’t like chocolate … unless. Unless there’s caramel involved. Then it woos me, just like these cookies are doing right now. These looks so ooey gooey and delicious! Chocolate and caramel are a wonderful match and even better with that caramel surprise in the center! I don’t make enough cookies. Now I want to make cookies. I think I’ll start with these cookies. Then work my way through your other cookies. Lol. Happy Saturday! You had me caramel… the chocolate is a bonus! I think I might top them with a little sprinkle of sea salt… I’m obsessed with salted caramel and chocolate at the moment. You’re killing me here!! That drizzled caramel!! Those are some yummy looking cookies! Oh sweet heavens! I need! I love how simple these are! This is my kind of baking, so easy! What a dangerous combo 😉 These wouldn’t last long at my house! These look sinful! I’d eat every last one of them, for sure. Caramel in the middle and caramel on top…yum! nice to stumble upon a fellow Wisconsinite! Wow these are so simple yet so sinfully amazing! Nothing like the marriage of chocolate and caramel! Oh man, that caramel drizzle is just calling my name! These cookies look so so good! The name of this cookie is enough to make me drool! Love the caramel inside and out. The only thing better than a double chocolate cookie is one with a caramel shoved in the center of it. Absolute perfection! Oh yum! The little caramel centers are the cutest little trick! Pinned! ©2019 Deliciously Sprinkled. Design by Purr.